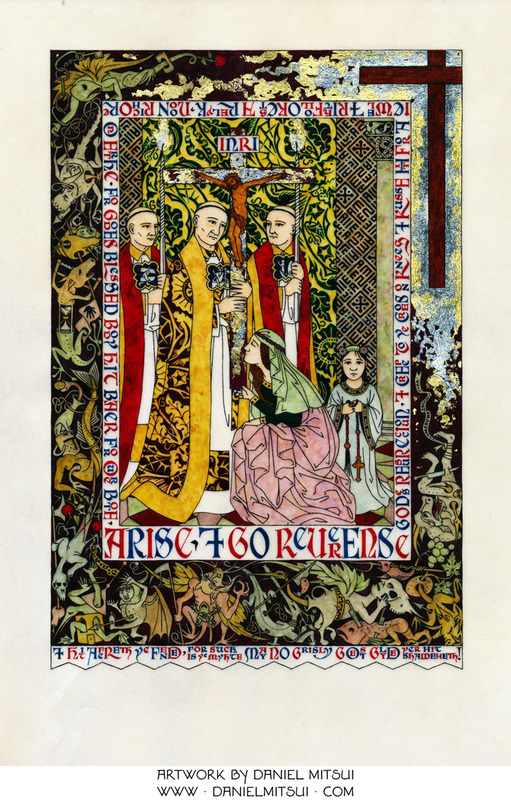 Those intrigued by liturgical practices of late medieval England, as well as those who are interested in contemporary illustration and calligraphy, should make a point of checking out this new work by Daniel Mitsui. The drawing depicts the “Creeping to the Cross” that occurred not on Good Friday, but on Easter morning, after the Crucifix is disinterred from the Easter Sepulcher, as described in Eamon Duffy’s book The Stripping of the Altars, and alluded to in The Vision of Piers Plowman. I encourage you to go and have a look at the literary and liturgical description at Daniel’s website. The details in this drawing are absolutely fascinating, particularly the intertwined monsters in the background, which seem to draw upon Bosch and Escher, and the Amen-Alleluia pattern behind the figures. Go here for the full description and image.